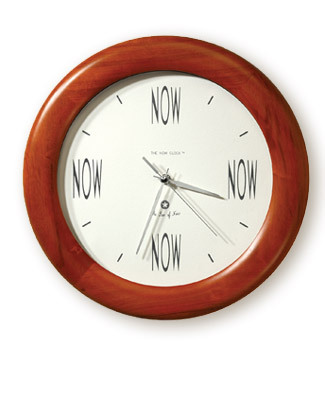 a peaceful timekeeper The NowClock™ is a brilliant, simple concept to help us all live more presently. The elegant Now Clock is presented in a richly grained, rounded wood housing with a satin cherry finish. Its face is printed on beautifully textured paper, displayed behind gracefully curved glass.